Ktunaxa Nation chairperson Kathryn Teneese and BC Aboriginal Affairs minister Ida Chong at press conference announcing revenue sharing deal, Jan 29, 2013. The B.C. government and the Ktunaxa First Nation signed a revenue-sharing agreement Tuesday that could see the two governments split millions in mining revenues from new developments in B.C.’s largest coal field, the Elk Valley. The agreement has the potential to make the Ktunaxa a significant partner in tax revenues generated from the coal fields, giving them, initially, more than a third of the region’s mineral taxes collected on new developments. The Elk Valley in the East Kootenays contains the province’s richest mineral resource, metallurgical coal, which is used for steelmaking in Asian countries. Last year, the major mining company operating there, Teck Resources, produced 23 million tonnes of coal. Although the agreement only applies to new projects or expansions to existing ones, Ktunaxa Nation chairwoman Kathryn Teneese said she expects the agreement to begin contributing to tribal revenues soon. She said she is aware of three new projects in the works within Ktunaxa territory, which covers 66,000 square kilometres in the province’s southeast. Existing mines also have expansion plans, she said. One of the new projects is Centermount Coal, which filed an application with the Canadian Environmental Assessment Agency Jan. 18 to develop a mine producing two million tonnes of coal a year over a mine life of 20 years. Exactly how much revenue the agreement will provide for the Ktunaxa remains unknown. But according to a 2011 report by consultants PwC, B.C. collected $129 million in mineral taxes that year. Coal, mostly from the Elk Valley, accounted for 90 per cent of those revenues. The First Nation has a population of 1,500 to 2,000 people, many of whom live off-reserve. Teneese said new housing is likely to be the main priority, but that the Ktunaxa also want to use the revenue to establish a heritage fund for the future. B.C. has signed four revenue-sharing agreements with B.C. 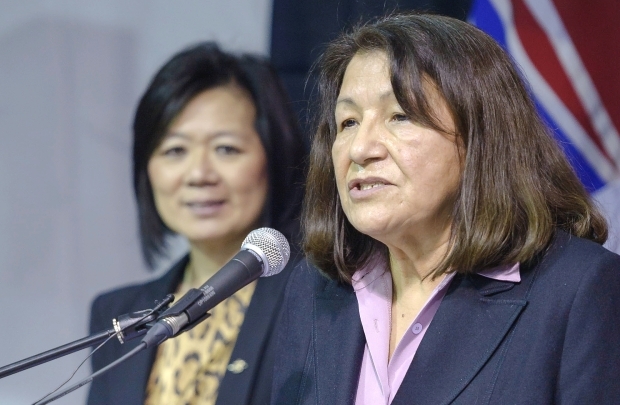 First Nations in the last two years as part of an initiative to make them partners in resource development and to increase certainty on the land base for resource companies, Aboriginal Affairs and Reconciliation Minister Ida Chong said in announcing the agreement Tuesday. The deal also includes amendments to an existing forest revenue-sharing agreement with commitments to provide future revenues. In 2013-14, the Ktunaxa are to receive $917,000. Dan Smith of the First Nations Summit Task Group said the Ktunaxa agreement is an example of revenue-sharing that all First Nations are striving to achieve. The government made the announcement at the Association for Mineral Exploration B.C. convention at Vancouver, where mining leaders have been urging support for current provincial resource policies. Posted on February 1, 2013, in Indian Act Indians, Mining and tagged band councils, chief Kathryn Teneese, coal mine, Elk Valley coal field, First Nations+revenue sharing, indian act band councils, Ktunaxa First Nation, Teck. Bookmark the permalink. 7 Comments. Interesting. This is the First Nation battling the proposed Jumbo Resort near Invermere as well. Sell outs.. how is the land going to look 50 or even a 100 years later. This is exactly what Harper wanted.. we have fallen right into his game. Assimilation already a done deal… I guess we will leave our decendants with the worries of toxins and destroyed lands… at least they may be rich… in money… You would think we as the People of this land could think in a different way… a way that would be sustainable and with a deeper feeling for the land.. as did our ancestors.. but like I say Assimilation. Where are the true Indians, the people.. I think many are sad and maybe only consoled by the belief that our Creator is a Just one…. Exactly what Harper is counting on, that First Nation people have no knowledge of what they may sign. That they will sign anything as long as money is involved. Signing on with B.C. government is only the beginning, and then destruction comes, only the two governments come out with $millions, when the mining is gone, only ponds full of polution is left on the traditional grounds. Fishes, wild game are destroyed, and peoples lives are being destroyed from long diseases, kidney diseases, and cancer. Just ask Environment Canada and Suzki Foundation. It’s great to see the Ktunaxa working with TECK coal on a government-to-government basis. IMBAs are not that unsual, and not that controversial. No need to get all “i’m an authentic Indian” about it. Thinking that way is also falling into a trap. Saying indigenous people should only act a certain “traditional way” limits us as people and creates misconceptions about us as well. It makes it seem like we are mired in the past, never adapting our culture to a changing landscape. The noble savage divorced from the modern world is not an indigenous creation – it’s a creation of people who have their own vested interest in how we act. These kinds of agreements recognize the fundamental reality that communities face – we need cash to survive, like it or not. It’s always funny, council members and Indian Act chiefs hate these kinds of agreements, but those tribal members who never have a voice love them. I wonder why? Hey Jay.. An authentic Indian ….. really? You sound like the like a government official. Are you? At least a part of the assimilated many. First of all the destruction of the land does not only affect Us authentic Indians… we are all a part of this creation… And falling into that trap you speak of has serverd our people well for thousands of years. I truly believe you along with the majority are really the ones who have fallen into the TRAP,,, Assimilated i.e. to have been absorbed into the dominant culture ( even if that culture is an unhealthy one) to catch ones dis- ease… etc… This so called modern culture is based on a history of superior dominance and has done its best to make our people …. just go away… and let them continue to consume this world until it is all gone… no problem we can just go and colonize Mars and assimilate the Natives there… Okay…. just being a little sarcastic… Maybe… I believe that this assimilation process was really the dominating cultures attempt to hide from thier own reflection that they are too, of this total creation… that all things have SPIRIT,,, and that we are one with all THINGS.. just like our TRADITIONAL Ancestors and all Indigenous Peoples of the World Believed and passed down,,, We Noble Savages are here and always will be… maybe that is why many of our people don’t like these agreements… You can’t take the bush out of the Indian….and if you are really strapped for cash as with most of us… maybe stand up and fight for our Land Claims… cut off lands etc… basically rent retroactive.. unless you are too afraid to rock the boat… Oh yeah that Boat is called the Titanic…..
we need Indigenous to be Strong in their Traditions, that being Stewards of the Land. We need New Reality for continuing Life on this Earth.